In the sleepy morning hours, I often find myself brewing a warm pot of tea to accompany me through the day. Spoonfuls of beautiful dried herbs, fragrant and colorful, say their hellos to me as I measure them into the pot. Easily measured out with my trusty spoon, it only takes a moment or two to get my tea going before I am called forth to the rest of the day. There are few different recipes I call upon each morning for my daily brew, and I always measure out my herbs simply and quickly in “parts” using my spoon. Using parts in herbal recipes as a measurement is an old way of measuring herbs that is referred to as the Simpler’s Method. It is indeed simple and extremely versatile! “I am one of those people who gets frustrated with exact proportions. Coffee mugs are most often my measuring cups, and spoons from my silverware drawer serve as measuring spoons” (Gladstar, 2008, pg. 378). What is A “Part” Anyway? Parts are one way that herbalists talk about measurements. A “part” is any form of measurement used to dole out the ingredients in a given recipe. Parts in herbal recipes can be measured out in by volume or by weight, though volume is perhaps the most common measurement used among herbalists. Weight measurements include ounces, pounds, and grams, while volume measurements include cups, tablespoons, and teaspoons. You simply choose the measurement you want to use and stick to that measurement through the recipe. Often herbalists will use what is at hand to measure their ingredients. Parts in herbal recipes measured out with a spoon that is on hand or favorite mug or even a bowl makes it fast and easy to whip up your herbal brews. Many herbalists provide their recipes in parts allowing great flexibility for the person creating the recipe. Bigger or smaller measurements can easily be used to create large amounts of the herbal preparation or small amounts based on the need. This makes it unnecessary to multiply teaspoons to see how many are in a cup or convert the weight of an ounce of herbs to a volume measurement. Sometimes herbalists will also provide a recipe in parts that can be made in a variety of ways such as an infusion, a syrup, or even a tincture. Let’s say you are making a tea recipe that is given in parts such as, 2 parts lemon balm (Melissa officinalis), 1 part spearmint (Mentha spicata), ½ part rose petals (Rosa spp.). Using parts in herbal recipes as a measurement really is a simple way to enjoy herbs, allowing for flexibility and ease in herbal crafting! And now that you know how to make recipes with parts as the given measurement, it is time to get busy whipping up some herbal preparations! Are you interested in studying herbalism? 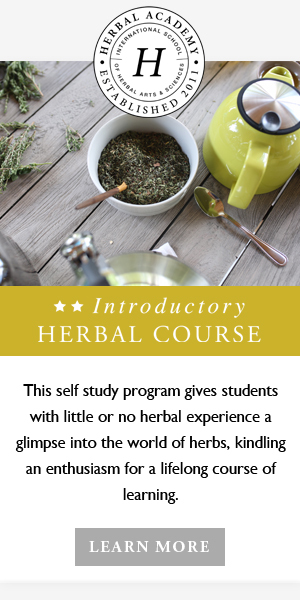 The Herbal Academy offers affordable, high-quality education for herbalists from the very beginning level to advanced! Visit our course page to learn more. Gladstar, R. (2008). Rosemary Gladstar’s herbal recipes for vibrant health. North Adams, MA: Storey Books.